Florida is known for its beautiful beaches and one of the best is Blowing Rocks Beach in Hobe Sound. I honestly never knew that Florida had beaches with giant rocks like these. After living on Florida's east coast for more than twelve years I can't believe that that I didn't know this beach existed. 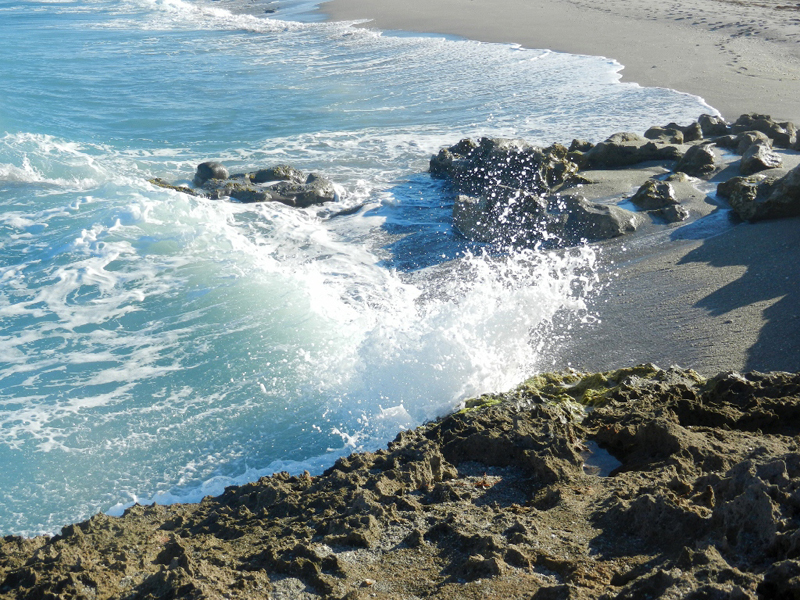 Located on Jupiter Island along AIA, Blowing Rocks Beach is reached through Blowing Rocks Preserve, operated by the Nature Conservancy. This beach was named because of the rocky shoreline consisting of Anastasia limestone. It is the largest on the east coast and actually looks live lava rock only the color is brown. Anastasia limestone is a type of sedimentary rock that was likely formed in the Pleistocene Age, approximately 120,000 years ago. Although this type of rock extends from St. Augustine to Boca Raton, the amount at Blowing Rocks is the largest on the entire Atlantic coastline. What is so unusual about it is the fact that usually this type of rock appears underwater or underground rather than on land. This rock is also known as coquina, named for the Spanish word for cockleshell. If you look at the rocks closely you can see fragments of shells, coral, and small fossils. 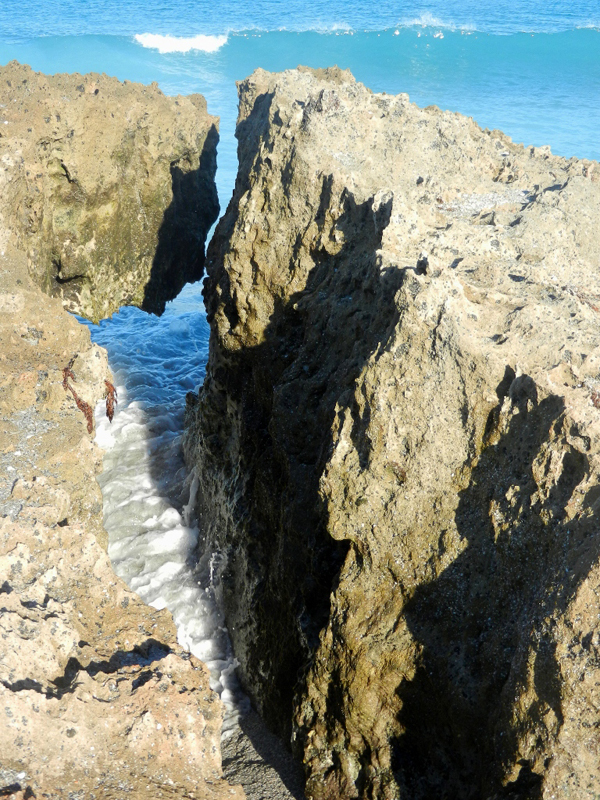 The beach here is particularly magnificent during high tide when waves crashing against these rocks can cause the surf to rise up to fifty feet heights in the air. A friend had recommended that I go at high tide and I am so glad I stayed for it and was able to witness first had these incredible sights. I even got wet trying to set up my tripod in just the right spot. I will definitely be back here especially when the winds are even stronger and the tides even higher. Access is though a path at the Blowing Rocks preserve where there are no more than twenty parking spots. A request for a $2 fee by the honor system is listed on a sign indicating to deposit the fee inside a metal tube. The preserve is open from 9-4:30 at which time an attendant comes and closes the access to the beach. I loved being there and loved the opportunity to capture some of the beauty of nature with my camera. Walking on the rocks can be treacherous and there areas where you do not have to actually go on the rocks. To get to where I wanted to be though I was on the rocks and you can assured I was treading very carefully.